On the slow zone point, I happen to live near the portion of the Red Line in question and can say that CTA didn't blow it this time around as both Red Line and Purple Line Express trains make it between Wilson and Morse with minimal slowdowns now. I say starting at Wilson because there are the obvious slowdowns near Wilson Station that come with the Wilson station rebuild. There's been some recent work occurring on a pocket of track near Morse which causes the only real slowdown on that stretch outside of the usual slowing of trains near Jarvis due to signal clearance waits approaching Howard, and that slowdown is minor. Until 1949, Evanston Express was a full-day run (except owl), non stop Howard to Wilson, then Chicago, Mart. When the north side L was rearranged and all subway trains run to Howard, Evanston was made a shuttle except Mon-Sat rush and Morse and Loyola were added as stops (Saturday didn't last long). Thinking was that skip-stop service with twice as many trains (Ravenswood was separated, but frequency in subway was unchanged) all-day express was not needed. Second reason was the urgency to reduce the mileage on wood cars, which is all that Evanston had at the time, since all the steels were needed for subway service. Google highlighted a Tribune story on my phone from yesterday's (Sunday) edition that highlights a huge contrast between public reaction to potential CTA land acquisitions for CTA's proposed Brown Line Flyover reorienting the junction between the Red, Purple and Brown Lines to the north of Belmont Station and those for the proposed Red Line extension to 130th. We all know that a lot of the businesses and residents that might have to move due to possible Brown Line Flyover land grabs reacted mostly negatively. The Trib story states that many of the residents and property owners who may have to move for a possible Red Line extension that were interviewed for the story have mostly said that they would gladly do so because that's how much that they believe the extension is needed and how much it would bring positive impact to the Roseland area on several fronts. Somehow, the end of the article brings up that Gray Line proposal without calling it that. It paints it as a cheaper alternative to the Red line extension. Yeah I saw that too. I take that as the Gray Line folks trying to create a dog whistle with that issue by bringing it up to get more attention on it when we already know that that proposal is dead while the Red Line Extension is at least still viable at least in theory still by virtue of CTA working on the environmental impact that's required to move forward to try to get funding for it. We all know that a lot of the businesses and residents that might have to move due to possible Brown Line Flyover land grabs reacted mostly negatively. The Trib story states that many of the residents and property owners who may have to move for a possible Red Line extension that were interviewed for the story have mostly said that they would gladly do so because that's how much that they believe the extension is needed and how much it would bring positive impact to the Roseland area on several fronts. However, since CTA has (on the board agenda) started buying up property near Roscoe, opposition to that may become moot. On the Roseland end, most of the property is already along the railroad track, and the people won't mind being paid to move. I remember once being in the path of a proposed expressway (it ended up being built 4 miles east), and my mother's reaction was that "if they are going to pay us to move to the suburbs, I'm not complaining." Then the next door neighbor showed us the packet of protest letters, and we drew floor plans for the new house on the back. Sure there's a numbers game in people affected due in part to a railway right away already existing in Roseland and in part population density difference, but as the article points out, CTA has to pay people to move in both instances. So the opposing reactions are still significant. There is the obvious expectation that someone from Roseland may be more open to being paid to move than someone in Lakeview. But the article gives the impression that the Roseland folks are also doing it out of more than just getting the money to move but also out of wanting to see the broader spoken benefits of the extension brought to the community. After all whether you're paid to do so or not, moving is a major disruption and can be a major pain even when it's to a relatively better area. Also the folks talked to in Roseland expressed disappointment that the soonest the extension can be made is ten years and wished it could be done sooner. 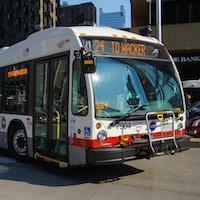 but as the article points out, CTA has to pay people to move in both instances. But the question always is how much. Since by federal law (Uniform Relocation Assistance and Real Property Acquisition Policies Act of 1970, HUD discussion here) means that CTA has to pay relocation expenses, that might be their ticket out. I'm also sure that there are people on the north side who complain about slow zones and want the RPM done next week. Only difference is that the Dan Ryan line south of 95th has been promised for about 45 years. Dont worry I think Rahm's going to try an get the south side the extension at least in the building stage, by 2019. This is when he goes up for re-election. He needs something positive for the south side vote to come his way but too much has happened for him I think. The city is now known nationally for its murder count and this police fiasco. He probably need to still tweak the department. I agree with that, but with all the bureaucracy, indications about this and the NICTD West Lake Corridor sounded more like 2022. For completion? Then that sounds right. It took the orange line four years to build. ('89-'93) I think it may actually take until 2019 to start it. If they can get rpm going too maybe he has a shot but still its a long shot. Its going to be hard for people to forget the past. No, that sounded more like to get it through the federal bureaucracy to get it funded. Remember, the current status (based on the What's New page), is to get comment on and hold a hearing on the draft Environmental Impact Statement. There is also a diagram in the FAQs on what steps need to be completed. On @jajuan's point, the EIS indicates only 26 residential buildings displaced by the west option. While I'm sure the proponent has explanations for this, these statistics show that those on the ME other than Kensington are not worth serving. I see they didn't cite 95th/CSU (north boundary of the study area was the I-94 connector). The key is that Metra is a primarily suburban commuter operation. Why people think that they can turn it into a rapid transit operation is beyond me. Basically because there is a station every 4 blocks. Obviously, though, as indicated in the EIS, the ME doesn't connect with anything, as opposed to all the Ls coming together downtown. The better question is why the stations south of 63rd, except perhaps for 95th, haven't been closed, except that Metra doesn't want to be called racist at a public hearing. Looks though that Kensington/Blue Island service isn't what it once was. Also, I bet most of the Kensington boardings are transfers between trains. Well the only transfers really would be express to local peak times and local to express at other times. My experience has seen a lot of originating boarding at Kensington, perhaps people driving in from South Holland, Calumet City, Lansing, and Glenwood. 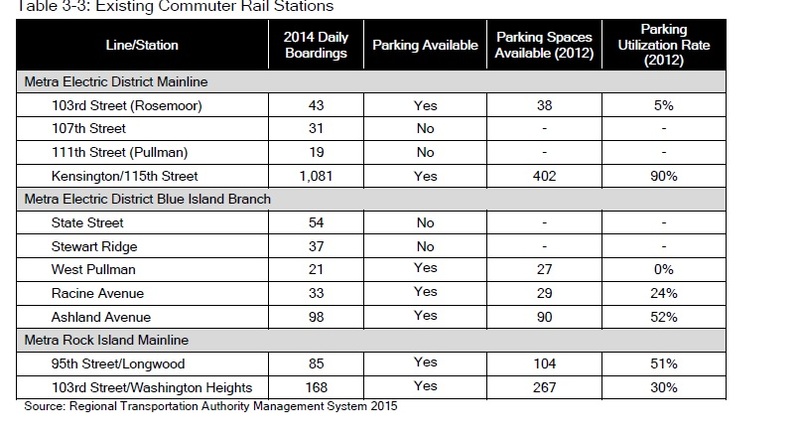 Cheaper to board at Kensington as opposed to Harvey and points south. Plus there's the option of the Blue Island express trains. But even with the 20 minute headways during peak times, ridership on the Kensington local is abysmal as the branches are as well. I would like to see Metra either promote the service or cut it completely. perhaps people driving in from South Holland, Calumet City, Lansing, and Glenwood. The parking lot utilization rate seems to support that. DNAinfo article about the community hearing. Again, it reflects @jajuan's point on ambivalence on having property condemned, but it was by someone who owns an apartment building as an investment. It also clarifies what I said in response to BusHunter that CTA projects "construction begining in 2022." Tribune story that the alignment is going to be announced. Only thing new is that it is supposed to cross over from the west side to the east side of the UP around 109th. If everything goes according to plan, it will open 8 years from now. Will Rahm still be around to see the fruit of his biggest campaign promise? Unless his last name is Daley, probably not, and it probably doesn't count politically until there is at least a groundbreaking. The comment in the article about the current administration's funding priorities also seems moot given that timeline. Only thing it establishes is that CTA will get about 8 years of use out of the bus part of the 95th St. station rebuild, if this goes by plan. Most of those stops are within walking distance of the proposed red line extension. If we take these numbers at face value, the red line extension itself isn't worth building. The point of the gray line proposal is that more frequent service, fare integration with the CTA, and branding the MED as an L line would have a multiplicative effect on ridership and allow the city to serve the same communities as the red line extension for a fraction of the cost. I haven't really seen any arguments as to why the red line extension is a worthwhile investment of public funds but the gray line proposal isn't, considering the gray line proposal serves the same general area for much less money. Merging commuter rail into rapid transit (the "RER model") is considered good transit policy in most of the world and even in other cities in this country. The ME boarding Busjack quoted are just that, ME hoardings. The idea is to shift the existing high ridership bus passengers riding to 95th to catch the Red Line to rail service sooner thus reducing travel times. As I have stated in the past, CTA is not interested in becoming a commuter railroad which would ADd to its expense. Minneapolis operates both LET and commuter RR, but neither existed there 14 years ago. Our systems date much further back. NY MTA isn't integrated with LIRR, PATH, nor NJT. No one here politically would subscribe to a super CTA. We can't even integrate Metra and CTA fares on Ventra. You can shift the existing high ridership bus passengers riding to 95th to catch the red line to the gray line and accomplish the same thing at a fraction of the price, can't you? If the point is to get people on rail as quickly as possible what does it matter if they board a red line train at 115th or a gray line train a few blocks east? What does it matter if they board a red line train at 130th or a gray line train a few blocks west? The difference between the two solutions is marginal for people who currently live south of 95th. The difference is that the gray line is a lot cheaper, can be online a lot quicker, and has additional benefits for people who live north of 95th that the red line extension doesn't. I don't think anyone is advocating a super CTA. What people are advocating is giving one specific Metra line to the CTA and running it as a rapid transit line instead of, or in addition to, a commuter rail line. Where would CTA maintain these Highliner cars? Who coordinates its schedules with Metra AND South Shore trains? How do you collect fares especially at downtown stations? How much does CTA pay for electricity, maintenance, trackage fees? Will CTA have to recognize a 3rd union for railroad employees? How much will CTA have to spend to upgrade every station. You do realize this so called Gray Line would be competing with the Red Line, the Green Line and CTA's South LAD express routes? Obviously there is no benefit to it if neither CTA nor Metra (who could get relief from dwindling ME ridership) won't consider the matter.